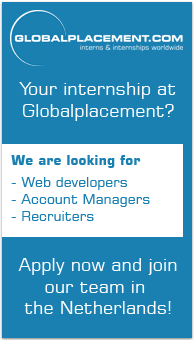 Globalplacement and Europlacement are part of a global network of collaborating partners. Our goal is form a centralized approach to increase the quantity of high quality international internships in the world. To achieve this goal, we focus on forming a collaboration between the worlds of education and work. Our network consists out of universities, chambers of commerce, trade unions, trade associations, government institutes, student and company networks. Joining our global network is not only great for corporate social responsibility, but also for financial reasons. An internship jobboard where companies can post vacancies and recruit interns themselves. Internship manager – where companies get their personal ‘internship manager’ which will be responsible for the recruitment of interns – on a ‘no cure no pay’ basis.